This image represents so much of what precedes the Most High's outpouring of wrath and destruction. It goes to the core of Satan's wicked agenda that's boldly being carried out by using music and sold-out musicians who are willing to play the role of 'pied pipers'. What do I mean by 'pied pipers'? 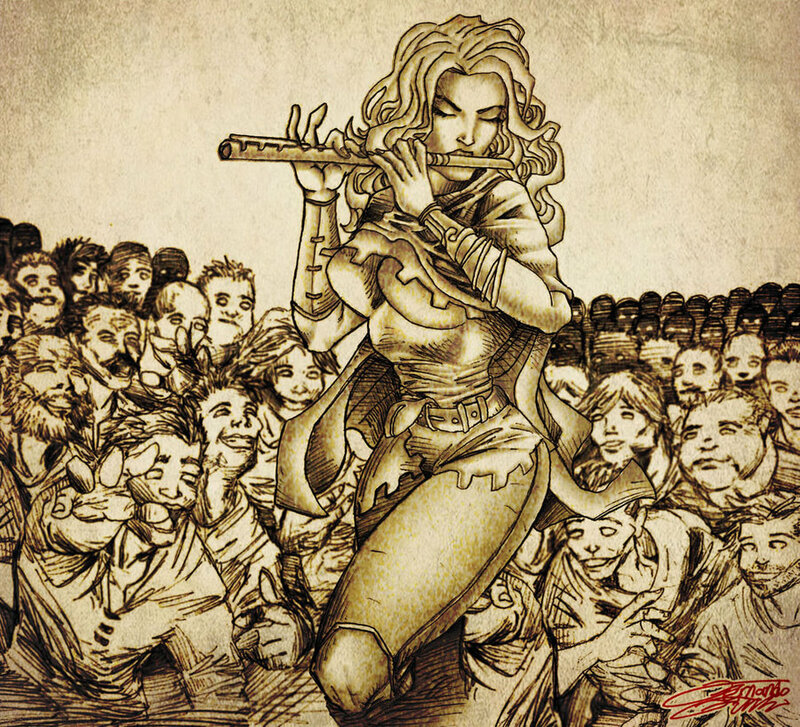 As legend would have it, the Pied Piper of Hamelin (or the 'rat-catcher' of Hamelin) dates back to the Middle Ages. It describes one who plays a flute-like instrument called a 'pipe', a rat-catcher dressed in multicolored clothing hired by the town to lure rats away with his magic pipe. The irony of the legend is: The citizens of Hamelin refused to pay the piper for his services, so he retaliated by using his musical magic to lure their children away as he had the rats. Now that you have some idea of the 'pied-piper' concept as it's applied here, let's get to the crux of things. Music carries energy, the rhythm of life. It intensely appeals to the emotions. Like the drugs commonly known as 'uppers', Music can be lifting. Or it can be a downer. It's no coincidence that music and drugs come as a package deal. Where there are music and music-making, you'll find the deadly use of alcohol, a variety of drugs, and cigarettes. Why is that? answer: All sinful roads lead back to Satan and his demonic hosts. You were the seal of perfection, full of wisdom and perfect in beauty. He was no longer called Lucifer, son of the morning, but Satan, the father of lies, once thrown out from the presence of YAH and cast down to earth for an appointed time. And knowing the powerful effects of music and rhythms, he took control of the music, profaned it with dark and demonic influence, and thus seducing the listeners into dark and demonic behavior. Demonic influence was once only boldly prevalent in rock music. Kiss readily comes to mind although there are countless other examples that are more subtle. However, demonic influence has taken over the music industry across the board. Taking youthful and wholesome performers and transforming them into dark, raunchy, and violent sexualized beings who have no inhibitions or moral fortitude. Agents of satanic agendas head music companies in the form of managers, PR persons, dance coordinators, producers -you name it. ALL facets of the entertainment industry have demonic gatekeepers. You get 'signed' only if you're willing to deny everything wholesome and right and take on an evil, rebellious persona. Basically, one must swear allegiance to Satan, sealing it by signing the contract. Young people -and some of the old -are captivated and swayed by the music and the artists' dark and evil images. They emulate these so-called 'stars' in the way they dress, behave and even the way they use slang language. Don't take my word for it. Just look around. -that is if you can see. The music that's currently clouding the airwaves carries an evil and hypnotic vibration. Your children are being influenced by it. Their souls are being snatched before your very eyes. And many of you think it's 'just a phase'. Silly, rebellious and disobedient parents who have a problem advancing through their stages of life, who refuse truth and righteous instruction in favor of rowdy and abominable living are being left to their own reprobate devices. A time is quickly approaching when you will regret your stiff-necked pride in refusing to repent and turn to YAH [GOD] with your whole heart, soul, and mind. You will weep bitterly at your children's suicides, their crime sprees, their kidnappings and murders, as you turned a deaf ear to the call, refusing to provide a covering of prayer and righteousness for your household. You left your children uncovered. You followed after the 'things' and 'pleasures' of worldly influence. And you rejected the bought-and-paid-for Salvation of Yahushua Ha Mashiach [JESUS] and chose the broad path of darkness and folly instead. Stay tuned for Pt. 2.